If you buy a quality transistor radio, you want to protect it. So Zenith made sturdy leather carrying cases to protect them when you were on the move. 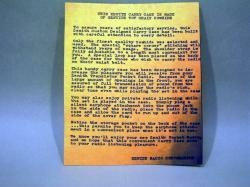 The first case designed for the Royal 500 hand-wired owls was issued with an instruction card as seen below. 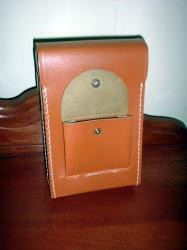 Leather shoulder straps also came with the coat pocket sized cases, some were removeable, others rivited on. However, years of use and deteriation have caused many straps to split, thus unusable. Sometime around 1960, Zenith started to use synthetic materials for most of their cases. These did not hold up well and most had short lives. The good news is that many folks just did not use their cases so it is possible to find some that are in nice condition, but brittle and prone to cracking if you start to use them now. Most cases also had a pocket on the back to house the earphone. If you are lucky, the snap on the little pocket will still be operational. The common 500 case also had a belt loop, but I would think that would have made it hard to keep your pants up.